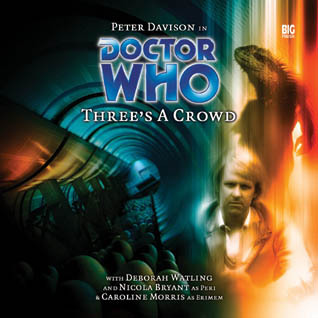 ‘Three’s A Crowd’ evokes the Peter Davison era of the classic series immensely well and, even if the plot becomes a bit predictable, it moves along at a quick and steady rate and boasts some clever ideas. The title could, of course, refer to the current TARDIS crew, but it also refers directly to the Earth Colony Phoenix where each human lives in complete isolation except at designated times when they may interact with one other individual. Over time, these people have become agoraphobic, afraid of social contact, and though Bellip does seem quite taken with Laroq at the social as she asks for patience in developing some sort of a relationship, the arrival of Peri by teleport throws everything into chaos. The revolutionary Vidler who wants to create a mass interaction of eight or more people helps to complete this strange backdrop for the story, but it seems like there are several missed opportunities for further exploration. The isolation of people and their preferred contact electronically clearly speaks to a trend in modern culture, and the fact that the podcasts the colonists watch are controlled by Auntie is another jab that never really gets explored. These ideas are pushed to the background even more, though, as the presence of alien eggs signifies a bigger presence, and it’s quickly learned that the regimented exercise programme the colonists are on is designed to keep them fit for more than just physical health. General Makra’Thon and the Khellian race are interesting if uninspired foes, and the Doctor quickly deduces that they have turned the colony into a farm system. Unfortunately, there are only some half-hearted moral debates present between the Doctor and the General since the Khellians picture themselves at the top of the food chain and don’t care what their food is, regarding humans as a force of destruction that hampers their own artistry and creativity. The revelation that the colony leader Auntie is complicit in the scheme through dealing and that she believed her family safe if she sent them away from the doomed colony is intriguing, but the Khellians’ betrayal of that plan is an unsurprising plot twist and puts them back into the mould of generic threat. The supporting cast does what they can with the script, Deborah Watling doing her best to take Auntie from typical villainous presence to someone who tried to do her best in a tough situation and then as someone having to accept the loss of her family and colonists. Likewise, Richard Gauntlet adds a great degree of menace to the role, but the dialogue he is provided with does little to create a memorable presence after the story ends. At the very least, the regulars are written and portrayed very well. There is an underlying current of tension aboard the TARDIS, and the Doctor recommends that Peri and Erimem spend some time together to discuss how they feel. Despite the magnificent sights they have seen, Erimem is growing tired of constantly being chased and put in danger and her pensiveness is weighing heavily on Peri’s shoulders as well. It truly does seem as though Erimem may leave the TARDIS here- something she has been considering- when the Doctor suggests that she would make an excellent colony leader, but she happily chooses to stay with the Doctor and Peri to continue seeing the universe and learning. ‘Three’s A Crowd,’ then, tells a rather traditional tale full of fascinating ideas and considerations that are never more than vaguely explored. Still, the acting is generally strong throughout, and the unique environment helps to create an enjoyable experience overall.